First pH meter was constructed in 1934 by Arnold Beckman. Glass pH electrode that have potential dependent on activity of H+ ions was constructed much earlier, in 1906 by Fritz Haber and Zygmunt Klemensiewicz, but the technical difficulties were preventing large scale use of potentiometric measurements of the pH (note that before 1909 pH was not called this way). Main problem was caused by large internal resistance of glass electrodes, which make measurements very difficult. To obtain reliable results one was forced to use very sensitive galvanoscope - expensive and difficult to maintain. To overcome the problem Arnold Beckman proposed to use simple high-gain amplifier made using two vacuum tubes. Amplified current was much easier to measure with cheap miliamperometers. Beckman's first pH meter - predecessor of Model G. This is a picture of original model made in 1934 and patented. Picture courtesy of Beckman Coulter, Inc. Idea soon prooved to be working and in 1936 Beckman decided to try to sell the pH meter commercially as Model G acidimeter, later renamed to Model G pH meter. He decided to put whole apparatus - amplifier, electrochemical cell, electrode, calibration dials, batteries and measuring gauge - into one wooden box, idea not so obvious in 1936 as it is now. Initially market was evaluated as 600 pH meters that will saturate global demand in 10 years. First year sales reached 444 items, showing that new market for measuring devices was discovered. Model G was made and sold till fifties, with device serial numbers reaching 126 thousand range in 1955. Model G pH meter. Device was closed in wooden box 12" wide by 8" deep by 9" high. It had a leather carrying handle, but - as for todays standards - was hardly portable, weighting almost 8 kilograms. Reference electrode and glass electrode were fastened to the door and could be used for measurements in this position, but they could be also removed if necessary). Picture courtesy of Beckman Coulter, Inc. While the Model G pH meter was commercial succes, it was soon discovered that the reliability of the glass electrode was very low. As the construction of apparatus forced the electrode to be used always in almost the same position in the solution (see the picture above), it was not so evident, but the independent study done at Stanford University showed that pH measurements results were very highly dependent on the depth of electrode immersion. This lead to the complete redesign of the electrode in 1937. 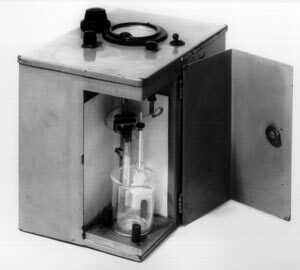 At the same time other manufacturers started to produce pH meters too - in Europe Dannish Radiometer introduced its first commercially available pH meter, model PHM1, in October 1937. 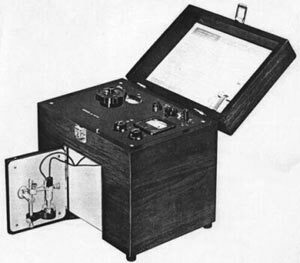 Although 82 years passed since then, almost all pH meters follow the same general idea - external pH and reference electrodes (often in the same housing), high gain amplifier, and amperometer, all in one portable box.